Need a hand with Google Analytics? We can help you! As you might know, Enhanced eCommerce requires a special kind of implementation. It goes way beyond your basic transaction tracking, and it would take a lot longer to implement, but the depth of the data would be definitely worth it. 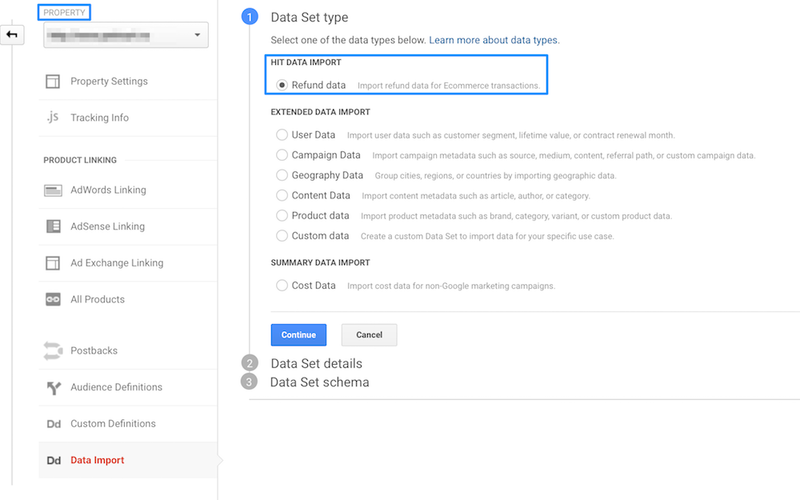 First and foremost, you have to enable Enhanced Ecommerce reporting for your Google Analytics view. If you already have set up Analytics tracking on your site and you want to move to Tag Manager, we suggest creating a new GA property for testing purposes. Having both tracking codes on the site might lead to counting the data twice for the same property. To avoid this, you want to remove the standard GA tracking precisely at the moment when you add the GTM one. Also, you want to thoroughly test the Tag Manager implementation before you put it live. There is a debugging section towards the end of the article, which I am sure that will be useful. For now, let’s go ahead with the core Tag Manager set up. 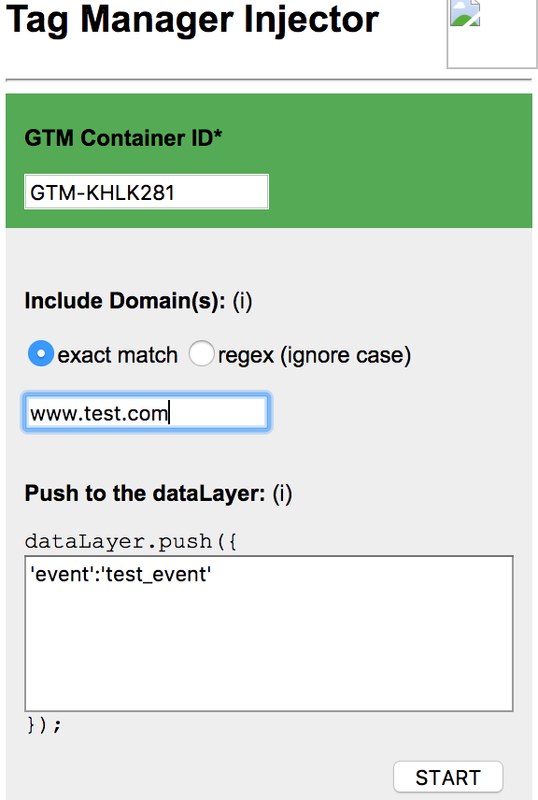 After you create an account and a container at tagmanager.google.com, it’s time to add the GTM code to the site. To start sending data to Google Analytics, we need to set up a basic pageview tag in GTM. Make sure you don’t forget to enable the Enhanced Ecommerce Features! Now, off to the exciting part. To make it easy for the development team, we are going to break it down by page type. The order of the implementation can be anything you want it to be. This way feels more comfortable to us, but there are other recommendations of how to do it. It’s up to you to choose the most suitable one. These can include category pages, brand listings, search results, custom taxonomies, and so on. Pretty much, every page that contains a list of products. The most important details to track here are product impressions and clicks. The first step is to populate the dataLayer with the Enhanced Ecommerce data. For these to work, you need to push the details to the dataLayer when the page loads. It should be enough just to have the code on the page for the tracking to work. If you are working with an infinite scroll type of load, you could add the impression code dynamically as the products are revealed. In this case you should be using an event to send the data. "category":"Men/Clothing/T-Shirts", //can be hierarchical up to 5 levels; separated by"/"
To check if it’s working, we need the help of the browser console. To see how an event interaction would work, check the product clicks section below. Keep in mind that Google Analytics has a limit of 8kb of text that can be sent in a request (~8000 characters). If you have a lot of products per listing, you might want to split the push into multiple requests. To see the results of this good amount of work in Google Analytics check the Conversions > Ecommerce > Product List Performance report. The dataLayer push is a bit similar to the impression one. The main difference comes from the way it’s triggered. The most common implementation is to use a custom event that occurs whenever a product is clicked. Now we need to grab the data in GTM. First, the trigger: a custom event having the same name as the one from dataLayer; make sure it’s unique throughout the container. Secondly, the tag: send the event to GA using the trigger we created; check to use Data Layer. 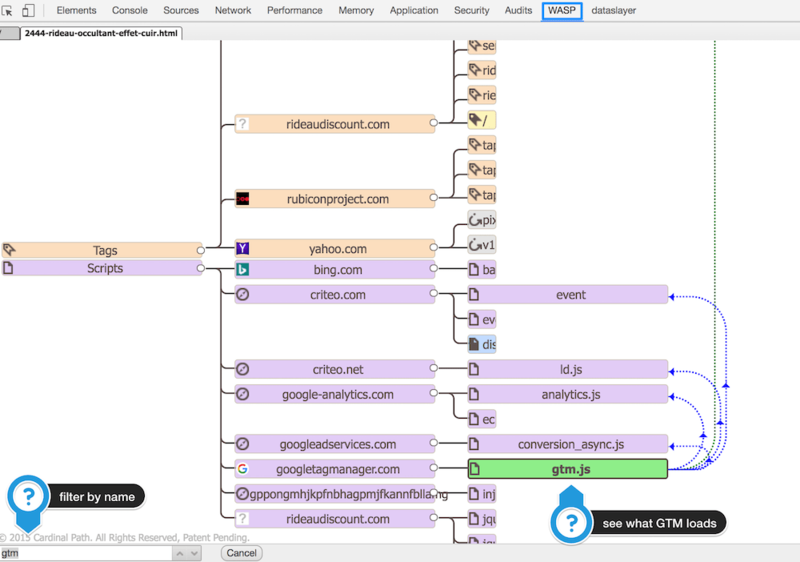 To make sure that GTM is tracking the event you can either do the good ol’ click-and-escape on a product or you can try the GTM sonar Chrome extension to block the default behavior of clicks (we explain how it works in the Debugging section of the article). 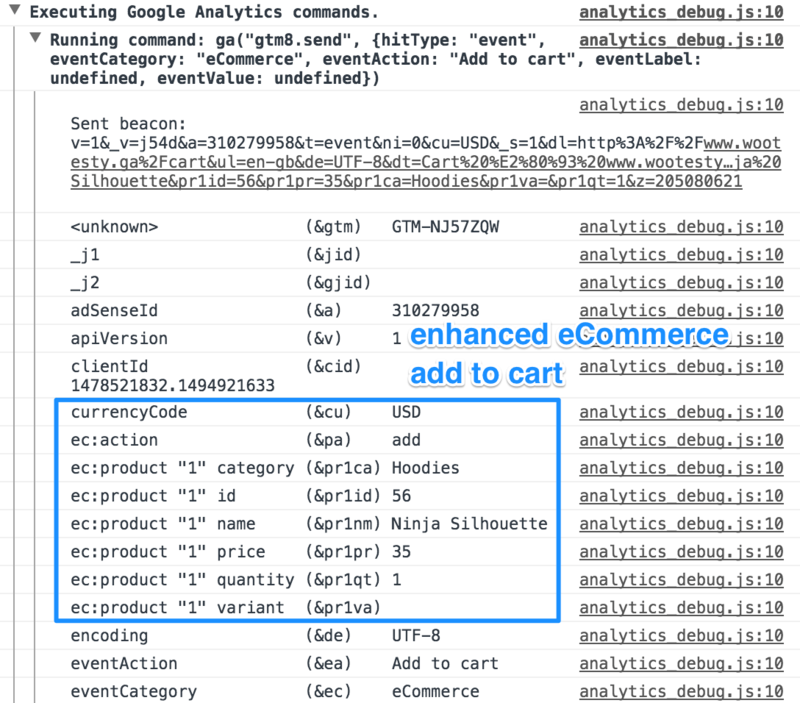 To make sure it goes to GA, have a look at the Real Time > Events report to see if “eCommerce – Product List Click” shows up after you click on a product. Analytics: The data is in the same report as the impressions: Product List Performance. 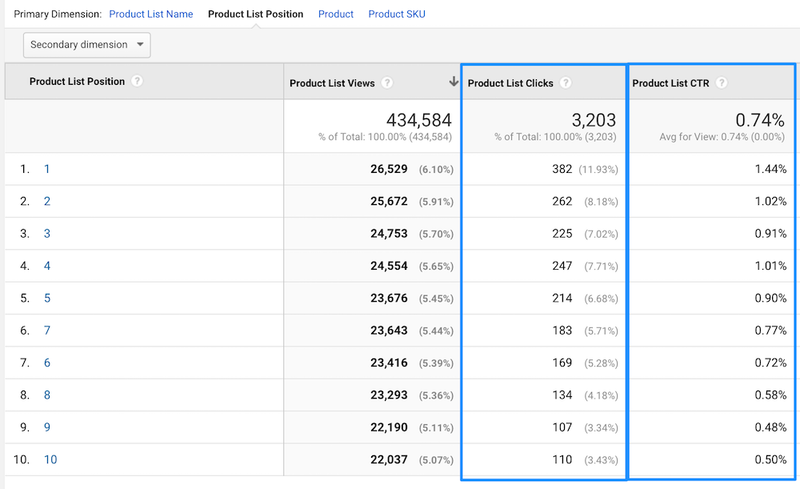 See the “Product list clicks” metric. It’s also used to calculate Product List CTR (list clicks/impressions). If you have the “Add to Cart” button on listing pages, you will have to implement the events as in the section below (Product page > Tracking adds to cart). There is a way to send the click data to Tag Manager without using an event. 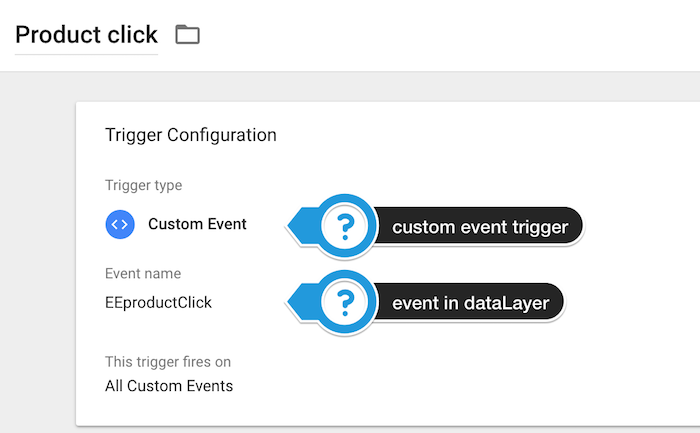 You could use the GTM auto-event tracking feature (“click” in this case). 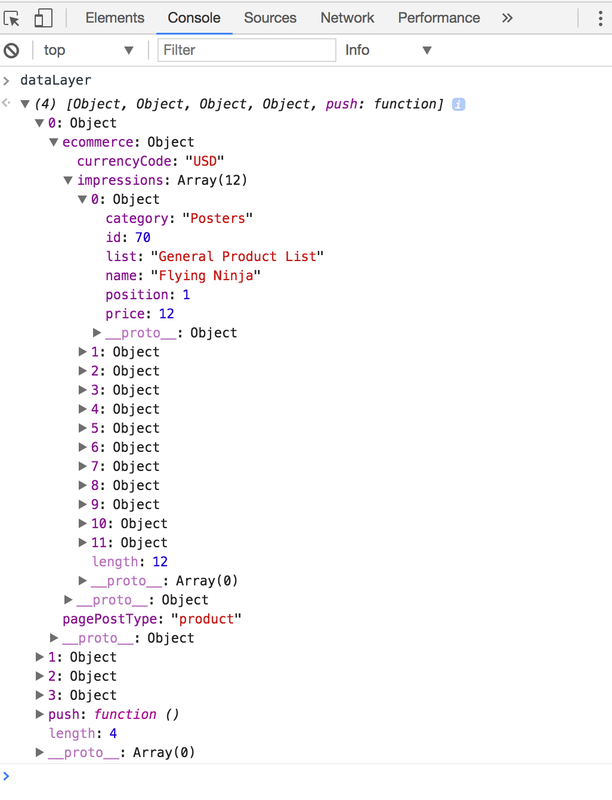 You will need to provide the data for the ecommerce object for each product somewhere in the web page code (using one or more “data-*” attributes for example). After that, you need to capture the ecommerce data into a GTM variable. After you get all the details into a variable, you need the same trigger and tag setup to send the event data to Google Analytics. In this case, you want to trigger the clicks only for products in listings, and the tag won’t be using the dataLayer to send the data to Google Analytics, but the custom variable you created. A bit more complicated, but not by far. The most important element to track on this page is the product detail view. 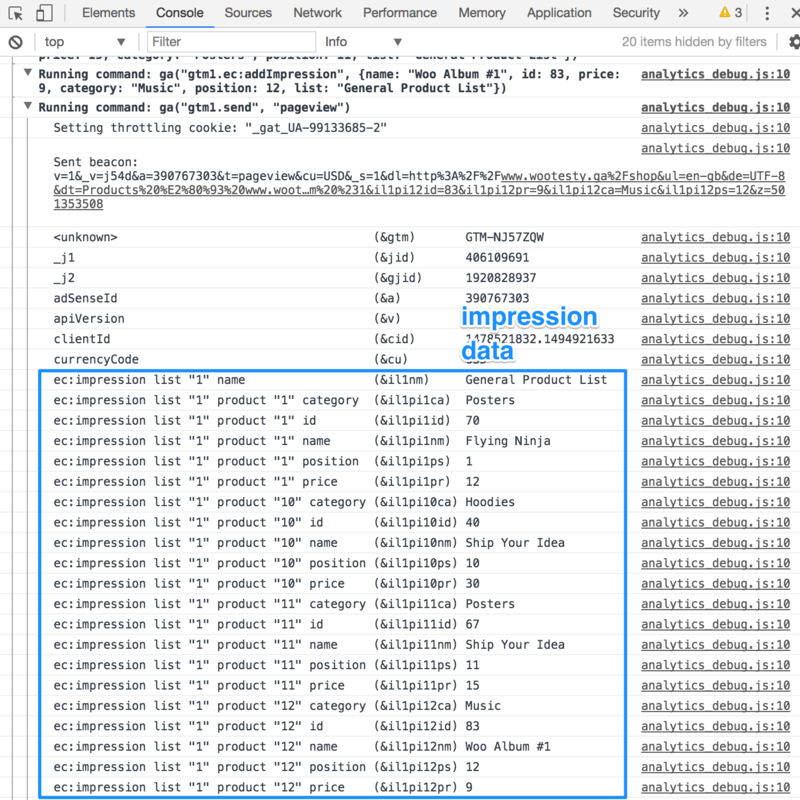 Similar to the product list impressions push, you can track the detail view just by loading the code for this pageview. Analytics With the product detail views, we start to get into the great looking reports, Ecommerce > Shopping Behaviour in this case. If related products like cross-sells or up-sells are present on the product page (most likely they are) you will have to track the impressions for these as we did in the previous section. The good news is that you can combine impressions and detail within the same ecommerce object. Keep in mind the 8Kb limit! If your store contains products that have different sizes, colors, materials, etc. set up as variants, you might want to consider tracking detail views for each one. The way to track adding products to the cart is by using a custom event. Below is a code sample for the dataLayer push. You will notice it’s a bit similar to the product click event. It’s important to mention that quantity comes into play in the ecommerce object (a user could add more than one item to the cart). 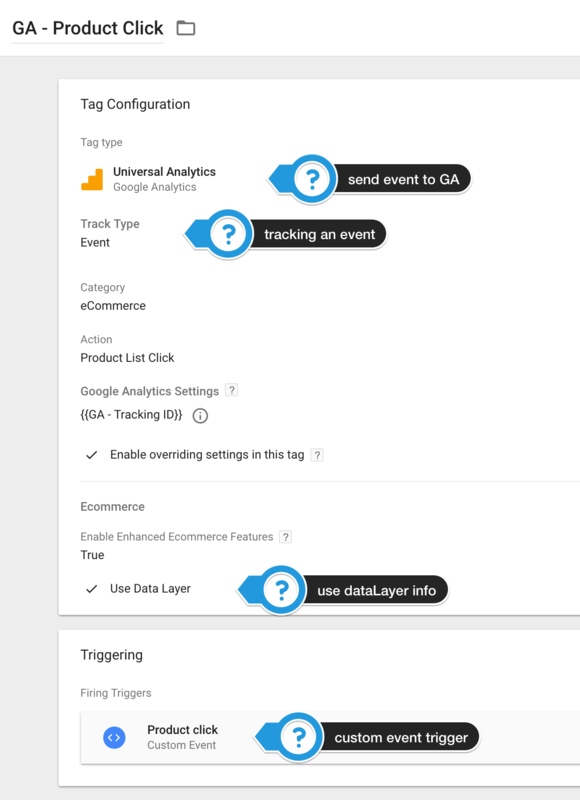 The Tag Manager setup is very similar to the one we used for the product click (see above): a trigger that captures the custom event (named “EEaddToCart” in this case) and a Universal Analytics event tag to send the dataLayer details. This might come as a surprise, but the cart page is not always a page per se. It could be a dropdown widget or even a section on the checkout page. 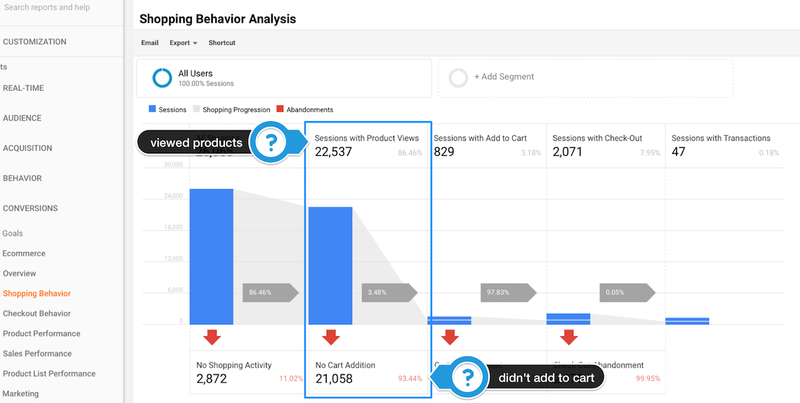 On each of these sections, you will want to track if a product is removed from the cart or if a quantity increase/decrease interaction occurs. The remove from cart is very similar to add to cart. Instead of the “add” object, you have the “remove” one. The quantity increase should be treated as an add to cart and the quantity decrease like a remove from cart. 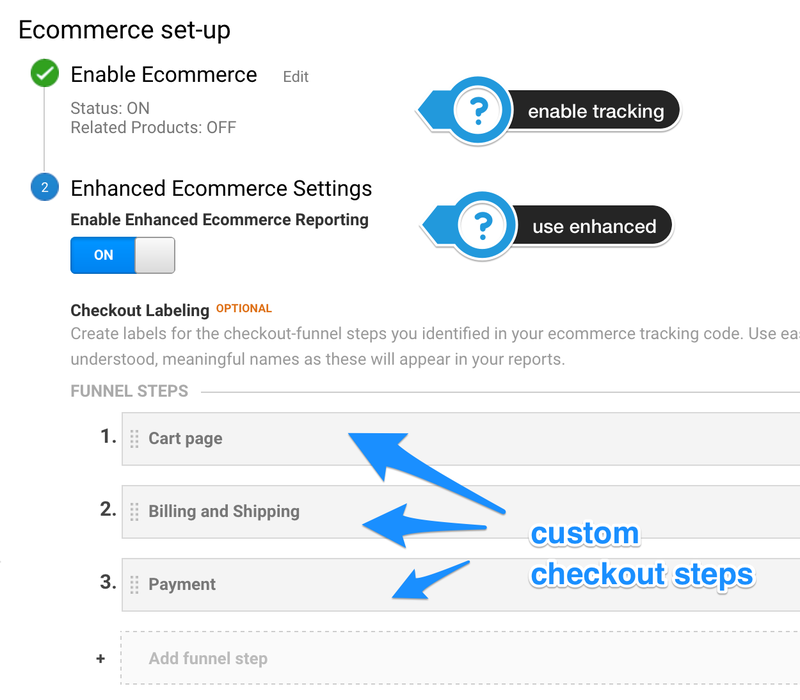 Remember how in the first section of the article we set up some custom checkout steps when we enabled Enhanced Ecommerce in Google Analytics? Now, it’s time to map out the steps in the dataLayer. Keep in mind that the thank you page is NOT a checkout step. We will deal with it in the next section of the article. 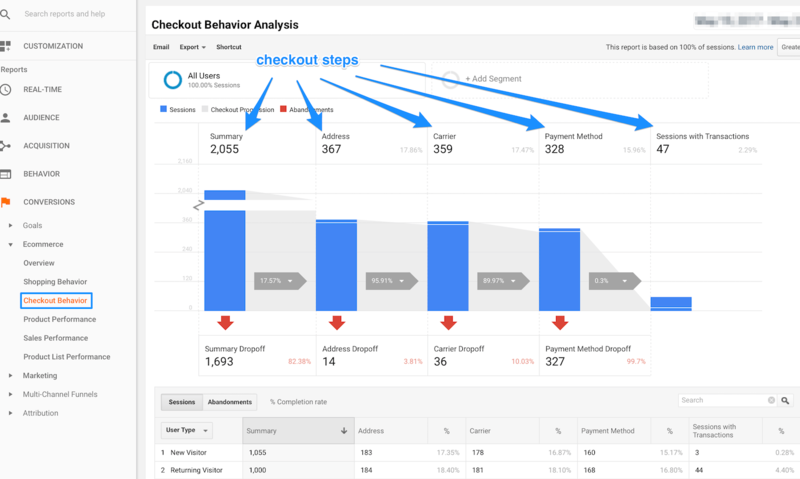 The most comfortable way to track the checkout is by using an event for all the steps (see the Tracking product clicks section for details on how to set up a trigger and tag in GTM that sends the data to GA). Notice the actionField object: it will map to the first step you set up as checkout option in GA (“Cart page” in our case). You could also consider the Cart page as a step in the checkout process. Another element you might find useful is the checkout option. You could track stuff like billing, delivery, payment options or whatever you can think of. It is a bit tricky because you might not have these details before the user submits the checkout form or before he moves to a next step. So you can send an event that occurs when the user does the action (moving to a next step or hits the submit order button), or you could use the checkout_option object to update the value for a previous step. The most important aspect to remember is that you should use the same event name across the checkout steps (“EEcheckout” in our case). For the subsequent steps, it’s not mandatory to add the products Array to the dataLayer. It’s enough to send them for the first step. Since we set up the GTM tag and trigger on the first step, no further action is required for the secondary ones. It might seem easier to track them as a single step, but you might want to add more depth to the data. Event though you have all the details on one single page, these are almost always grouped into sections like Billing, Shipping, Delivery, Payment. Now depending on your coding skills, you could track each of these sections as a different step in the checkout process. Here we have to send the purchase confirmation event. We have to capture it in GTM using the same tag and trigger type of setup we used for product clicks, add to cart, etc. The actionField element stands out since it contains a bit more information than we have seen for the other dataLayer pushes. The products object is again mandatory at this point. On the confirmation page, we should pay close attention, so that duplicate orders are not being sent to GA. Even though there are ways to do that in GTM, the easier and safer route would be to do it on your end. Mainly, you want to avoid loading the transaction code more than once. You could very easily implement this by inserting an entry in the database once the transaction code is loaded the first time. In Google Analytics the Enhanced Ecommerce transaction offers pretty much the same information as the basic one, except for a few more details like coupons, hierarchical product categories, product variants. These can occur on any page. 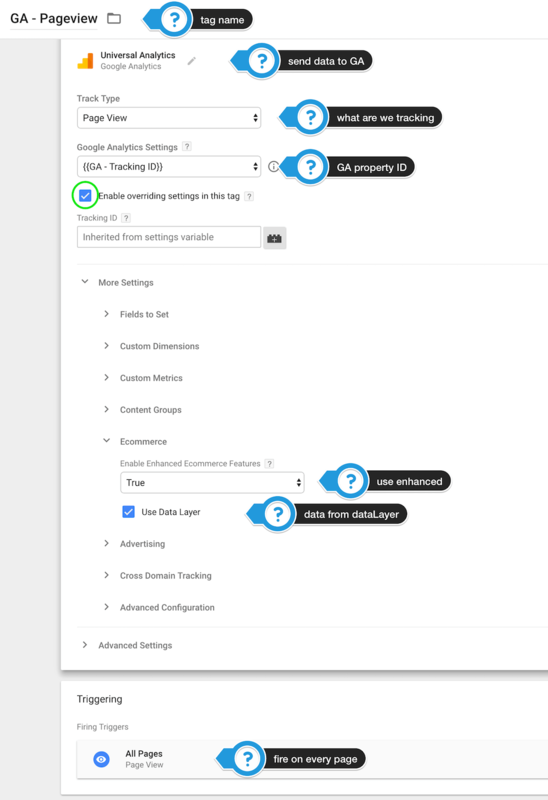 So if you want to check the performance of your banners/promotions, you will have to push the data to the dataLayer on whatever page they are displayed. The good news is that you can group them within the main ecommerce object. These should be tracked when the page loads, with no further action required in GTM. Promotion clicks should be pushed using a dataLayer event. See the product clicks section for the GTM setup. 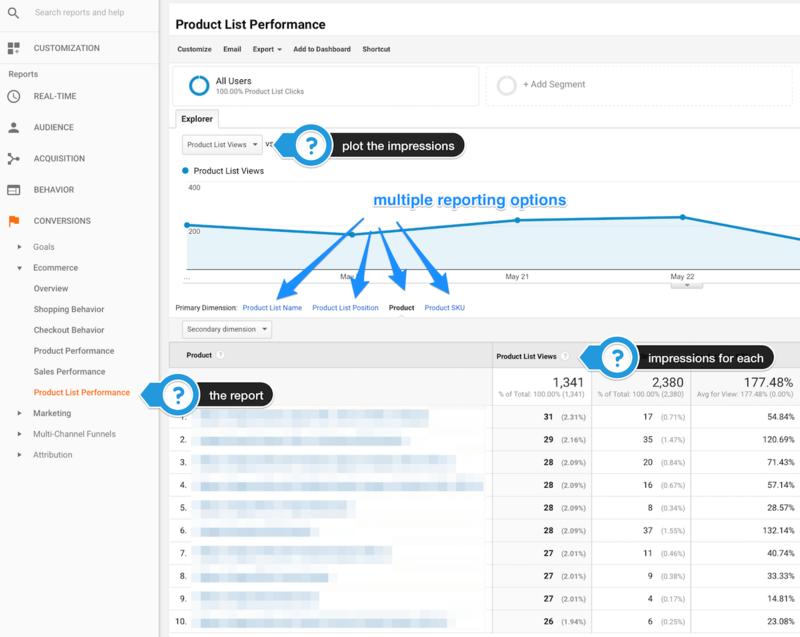 To check the performance in Google Analytics, go to the Ecommerce > Marketing > Internal Promotion report. If the users can refund products on their own by completing a process on the website, you could track them using the dataLayer approach. Just make sure to match the ID of the original order. To set up partial refunds, you have to add a products array with the refunded products’ IDs and returned quantity. If the refunds don’t happen within a user interaction process, the easiest way to send them to GA is by doing an import from a spreadsheet. The data import happens at the property level. It can be done by manually uploading a spreadsheet from time to time or by using the management API. You could also use GA’s measurement protocol to track the refunds, but it’s a bit more advanced technique. This part is crucial since a lot of things can go wrong if you are not careful. Honing your troubleshooting skills would make your life a lot easier at this point. Before getting into the tools that make our life easier, we should take a moment to think about an important distinction between interactions: those that take place when the page loads and those that happen when the user clicks on a particular element. Another thing to keep in mind when looking for issues is, you guessed it, consistency. You want to make sure that the essential elements like product names, IDs, etc., are the same across all dataLayer variables from every page. For example, if you are using SKUs instead of product IDs, make sure they are the same every step of the tracking. Aside from the major help the Tag Manager Preview brings, you might find some of the following very useful. 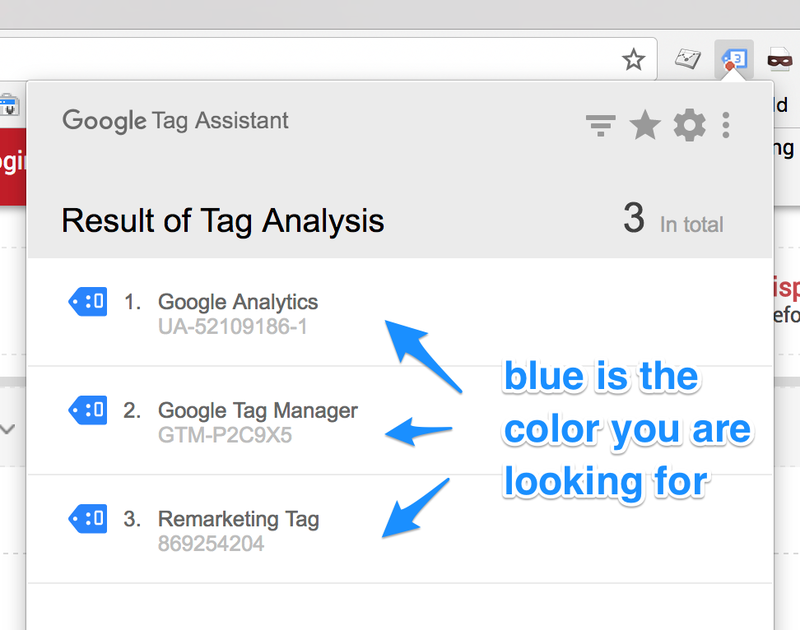 An uncomplicated and helpful Chrome extension that lets you know if tags like Google Tag Manager, Analytics, Adwords Remarketing or Conversion Tracking, etc., are working as they should do. Once you start recording, you can navigate through multiple pages and get a summary for all of them. 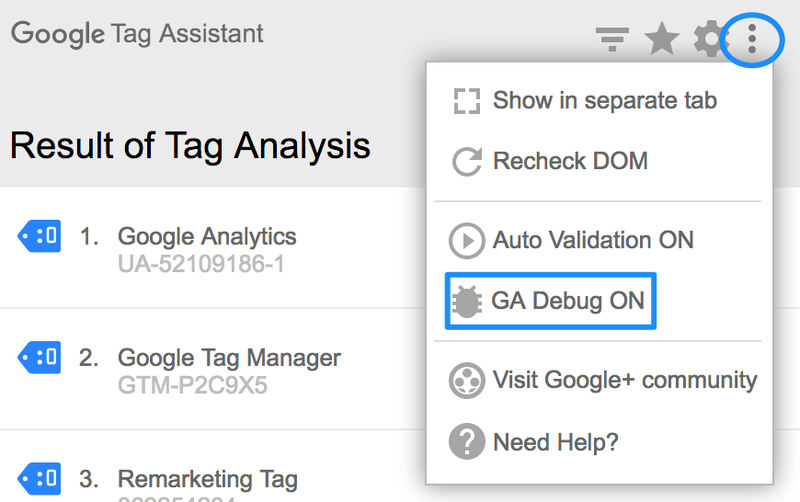 There is also an option to turn on the Google Analytics debug mode. 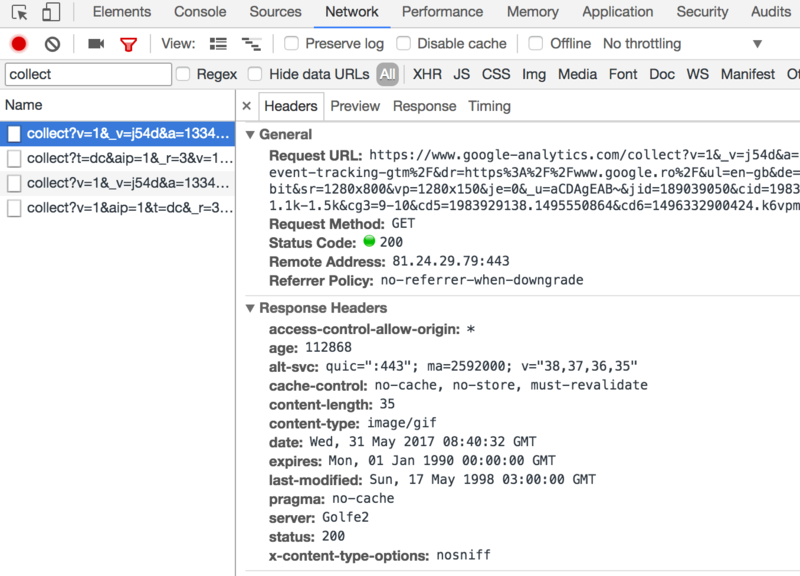 It’s useful if you don’t want to add one more extension like the Google Analytics Debugger of which we will talk about next. 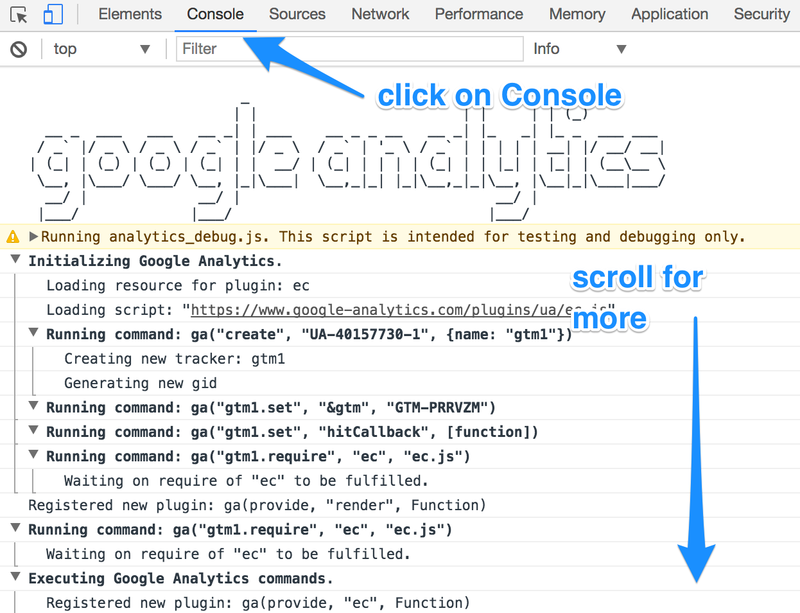 The simplest of Chrome extensions: just click on the icon and it turns on the debug mode of Google Analytics. You will get the tracking data in the console. We’ve seen it’s major utility when we implemented product impressions and wanted to see if Google Analytics records them. A very handy Chrome extension that outputs the dataLayer interactions in the order they occur. For us, it has been very helpful in revealing validation errors. You might not notice them just by looking at the code. It’s designed to block the default behavior of clicks and form submissions. 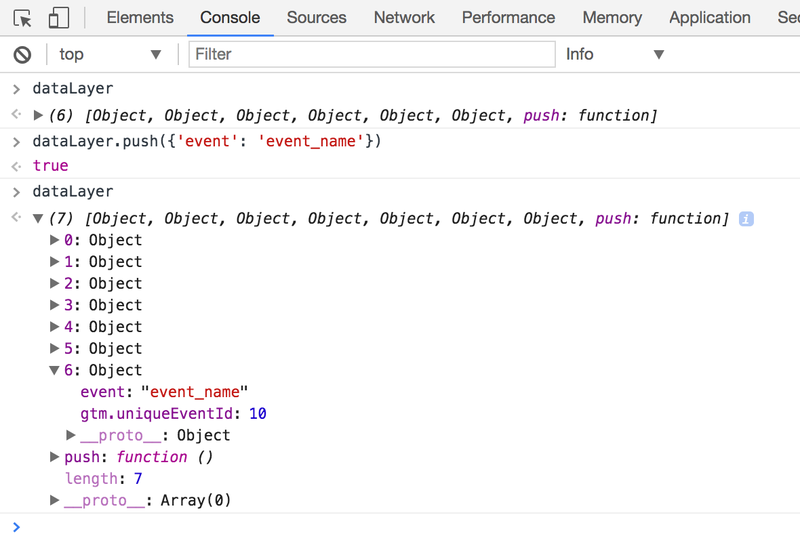 This way you can easily use the other tools to debug events. Other tools such as dataSlayer or Omnibug record the activity (live pageviews and events) across all the pages you visit. 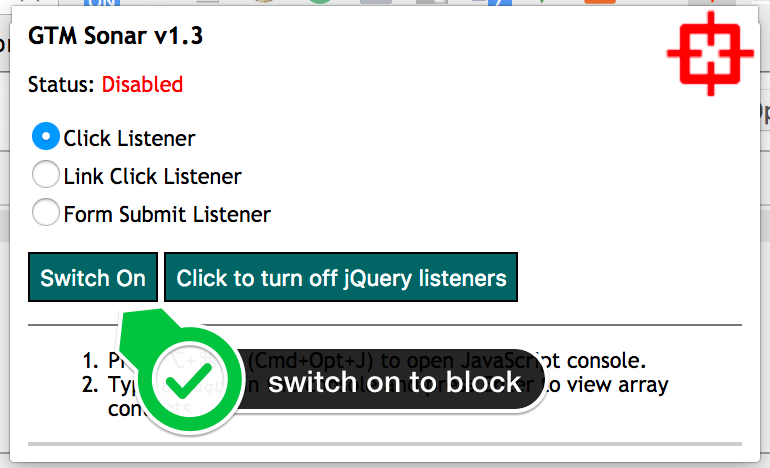 This way, you could avoid the hassle of blocking the default behaviors of clicks or form submissions. This one is useful if the website for which you are trying to configure Tag Manager doesn’t have the code in place. A bit more advanced tool that reveals how scripts and tags are deployed on your website. You can also have a look at the Analytics collect calls and what triggered them. custom tabs generated by browser extensions like WASP, dataSlayer, Omnibug, etc. The best way to start digging into issues caused by the website is to look at the server logs. First, you have to get your hands on the visitor’s IP address. If he/she has placed an order, almost every eCommerce platform will display the IP in the admin area. If the user didn’t manage to place the order, you would have to become a bit more creative to get it. Just keep in mind that Google Analytics doesn’t show the IP address anywhere because of legal matters. But once you get your hands on it, you can filter the access and error logs to display the activity for a certain user. This information will help you track down a lof of problems. You might notice that the Enhanced Ecommerce implementation is not as simple as pressing a button. But with the amount of new data you have the ability to take an eCommerce business to a whole new level. The truth is that the hard work begins after the implementation. Putting the information to work is the real value! 1. The tag manager setup/recipe we used along with this article. You can get the JSON configuration file from this link. 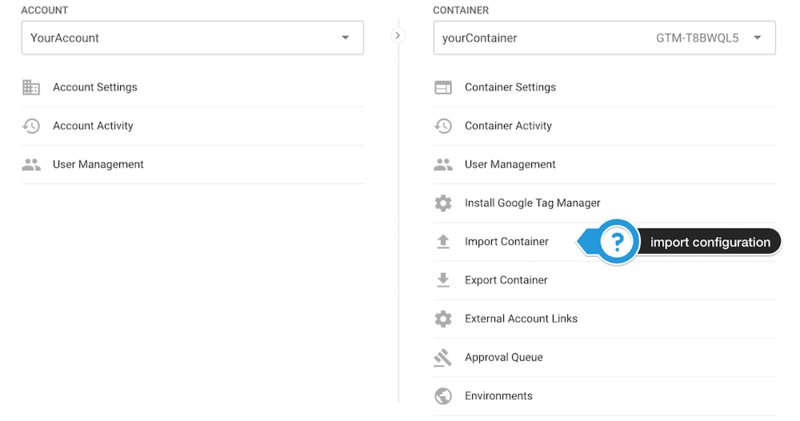 Get it into your Tag Manager container just by hitting import from the container settings menu. To avoid any issues, we recommend merging the details to your current container, not to overwrite it. 2. A Google Analytics Custom Report for Product Performance Data: you can get it from the Solutions Gallery.